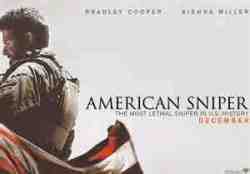 “American Sniper” separates itself in three ways from the typical Hollywood war epic combined with ’based on a true story’. The performance by Brad Cooper is exceptional, the story, written by Jason Hall, revolving a man who became a ‘legend’ in his own time offers a strong focus and the direction by Clint Eastwood is clear cut. Navy Seal Chris Kyle does 4 tours of duty in Iraq and as a sniper records a minimum of 161 enemy deaths, though many think the figure was a lot higher, and earns the nickname “Legend“. He is a man who believes in Country, Texas, God and Family, not necessarily in that order. While he is serving his country his wife is raising their 2 children alone. When he is home as his wife, played by Sienna Miller, tells him, “Even when you are here, you aren’t here”. The screenplay is based on the book written by Chris Kyle with Scott McEwen and Jim DeFelice which may account for not showing how much of what Kyle goes through affects his wife and cries out for a film on how a wife of a warrior deals with post-traumatic stress disorder. Both do their best with being a parent with one across the world and when the father comes home his mind and heart are still behind enemy lines. Maybe because it is a war film there are the clichés of who will be wounded and/or killed and if you have seen 2 or 3 films you will know who fits the script . The violence and brutality are also expected and not gratuitous. Clint Eastwood’s direction is clean and clear cut staying out of the way of the actors including a tense opening scene where Kyle, the sniper, has to decide whether to kill a young boy and his mother because they could be aiming to blow up a group of American soldiers. Sienna Miller is stronger at the beginning of the film and seems to be slighted the second half while all the supporting players do more than the director could have asked for. Bradley Cooper has just been nominated for his third Oscar in a row and if there is any question of his ability as an actor his role of Chris Kyle will wipe that out. He is a Texan and a U.S. Navy SEAL and not only with his bulked up physical transformation but with his movements, feelings and face. There is no trace of ‘The Hangover’ actor here. When he is being mischievous it is in character as a soldier who relieves pressure with corny jokes and bawdy exchanges with his fellow soldiers. I went reluctantly to see “American Sniper” but I can recommend it without hesitation even if you aren’t into the ‘war genre’.